Advances in chip architecture and solid-state disks (SSDs) has improved the performance of storage systems worldwide and the services that those technologies power. The growth of enterprise SSD use over the past five years has been impressive. Between 2012 and 2017, the value of enterprise-class SSD revenues grew from $3.0 billion to $11.4 billion based on recent industry data from Gartner, The Register and Stifel. In 2017, enterprise-class SSDs value sales exceeded enterprise HDDs value sales for the first time. 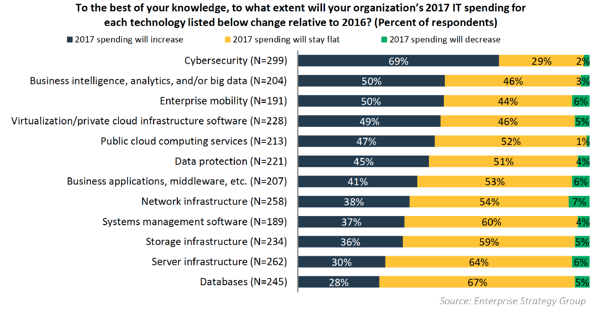 The IT expenditure trends show a more evident likelihood of growth in strengthening cybersecurity and furthering big data analytics initiatives, mobility, and virtualization while public cloud deployments needed to deliver those technologies often require low-latency, high-bandwidth storage provided by flash technology. This growth trend in recent years allowed the development of many different memory/storage innovations used in on-prem and in the cloud. Among these innovations, we can find Software Defined Storage which allows to integrate SSD and HDD, optimizing both performance and cost; Non-Volatile Memory Express (NVMe) over Fabric that seeks to expand the domain and reach of SSD devices across wide networks; and Intel's' Optane memory accelerator/expander scheme that seeks to offer DRAM-like performance with the power and non-volatility of flash. According to the 2017 Public Cloud Computing Trends Report by Enterprise Strategy Group (ESG), 78% of the organizations surveyed use at least one of the three public cloud computing service models, and another 15% plan to do so or are interested. 36% of those respondents claim to be taking a cloud-first approach. There are many flash storage solutions and a wide range of ancillary service and support capabilities in the market. Nevertheless, logic dictates that the smartest approach when integrating optimally this mix of technologies is to find a single vendor offering all those solutions under one umbrella. HPE’s portfolio includes “Predictive Flash” storage with native cloud integration that work as a “flash fabric” across primary flash, secondary flash and multicloud storage. Named HPE Nimble, this hardware and software technology enables a free flow of data between onsite arrays and the cloud when used with the Cloud Volumes public cloud storage service. HPE also developed Flash Now, a program that provides cloud-like consumption flexibility and low TCO for data that must reside on-premises, allowing organizations the flexibility to pay the infrastructure in a similar way they would pay for subscription-based cloud services lowering CapEx in the meantime. Overall, when it comes to choosing a partner in the emerging world of hybrid IT, it’s a good strategy to choose the one that offers you the wider spectrum of options so that you don’t get constrained by a limited choice. Hybrid IT, by its definition, demands flexibility and optimization in products, consumption models, and on/off-prem decisions. 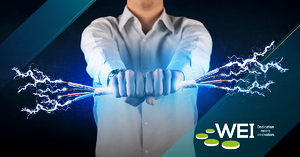 The vendor that complies with the widest range of product and services, as well as provides total freedom of choice as you work to achieve flexibility is the best option you can choose, and WEI can be your IT solutions provider along the journey. Not only do we develop custom technology solutions to support your hybrid IT goals, we can integrate and test your hybrid IT solutions in our state-of-the-art proof of concept lab. As flash becomes a standard storage medium, it can provide a way for organizations to accelerate performance of on-premises applications, and do much more in a highly efficient manner. To help these organizations elevate their IT conversations “beyond storage,” HPE offers orchestration and in-array automation hooks into containers and cloud-native ecosystems to perform diagnostics and handle performance problems. Are you currently implementing your hybrid IT strategy? What types of roadblocks have you encountered along the way—and how did you overcome them? Get the conversation going by leaving a comment. We've compiled a few of the potential challenges and offer tips for planning for success in our white paper, "The Challenges of Implementing a Hybrid IT Model." Click below to download a copy, and share it with your colleagues.